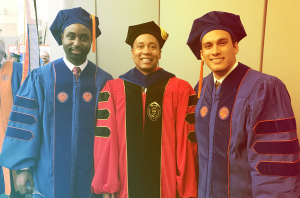 The University of Florida Department of Computer & Information Science & Engineering (CISE) is proud to announce the graduation of its first two students from the Human-Centered Computing (HCC) Ph.D. degree program. Chris Crawford, whose research focuses on brain-computer interfaces (BCI) and human-robot interaction, and Marvin Andujar, whose research focuses on effective BCI, graduated this past weekend after passing their dissertation defenses. Though HCC classes were taught prior to the start of the program, the opportunity to earn a Ph.D. degree in HCC officially became an option in Fall 2016. The idea of creating an HCC Ph.D. degree came to CISE in 2014 when the department hired Gilbert, who was one of several preeminent hires at the time. Gilbert, who was recruited from Clemson University, brought with him several students and faculty whose research primarily focuses on HCC. The department’s HCC students have worked with companies such as Google, Intel, NASA and Harris Corp. Many of the department’s Ph.D. students receive funding, with the largest awards at four years of guaranteed. Crawford and Andujar were two of the 20 students who followed Gilbert from Clemson. Crawford is expected to start this fall as an assistant professor in the computer science department at the University of Alabama. Andujar is expected to start this fall as an assistant professor in the computer science department at the University of South Florida. Interested in learning more about our HCC Ph.D. program, visit our degree page.